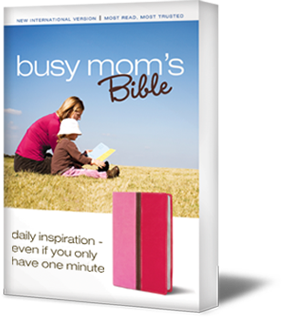 I recently received the Busy Mom's Bible, by Zondervan, for free and was asked to review it for my blog readers. So, please note that the following are solely my opinions and should only be regarded as such. I've long been told that you should always start with the positive, so I will. When I first opened the Bible it was very aesthetically pleasing. Hot pink leather! What more could a girl ask for? I absolutely love the look of this Bible. I also like that it's the NIV translation. For all of you out there who are King James only readers, please remember that these are merely my opinions. Do also keep in mind that the King James is also a translation. Now for the downside, and I really hate to even say that, because what downside could there be to God's word, right? It's not His word I have concerns with. It's the concept of the busy mom that has me somewhat concerned. Throughout the Bible, there are pages with devotionals on them, giving you the option for a 1 minute, 5 minute, or 10 minute study time. I flipped through, counting the devotionals. There are 13 pages with 4 devotionals on each, thus 52 devotionals. Is that a coincidence? I hardly think so. 52 devotionals, 52 weeks in a year...... To allocate 1 devotional per week with a maximum of 10 minutes allocated (and as minimal as 60 seconds) to me seems to imply that this is acceptable. That it's okay to be a busy mom and only spend 10 minutes a week in God's Word. Shouldn't it be more geared towards saying something more along the lines of: "How to tell your kids no". "Time management 101" "Making God a priority". Etc. It seems more emphasis should be placed on saying "No honey, you can't play baseball, basketball, soccer, be in the band, and take karate lessons." "I'm sorry, sir, but I can't come in early or stay late." "You need to stop watching TV for 2 hours in the evening", rather than inadvertently justify being so busy that you can only manage 60 seconds for the Lord. Might women spend more time in prayer and Bible study than is allocated here? Absolutely! And that's wonderful. But I fear it might also send the message that fitting God in where you can is okay rather than encouraging women to set their schedules aside and make God the true priority. Overall, would I recommend this Bible to someone? Of course, because first and foremost it's God's word. That doesn't change. And don't forget, it's hot pink and cute as a button! Just remember, despite how busy life can get, you'll never regret making Him a priority.